For me football is a game of love and passion and having been so involved in the sport for so long, this love and passion just radiates out of me. I have always heard that in order to live a happy life you do the things you love. Football is my first love. My name is Rick Niacin Leonty and I live in St. Lucia. In St. Lucia, in particular the small fishing community where I live, one of the biggest challenges is finding a job — especially for young people. The road to ‘employment’ that young people often take is to join a gang. On top of that, the poor education system is a big problem here too. These problems often lead to a lot of anger and resentment in young people. They feel hopeless. It’s a feeling I know too well. Without the beautiful game I don’t know where I would be right now. Football has helped me personally so much. It was a way to boost my confidence. Growing up as a young kid in my small football community, it was really hard for me to get involved in the sport. When I was 12 years old I tried to get on our district football team called the Canaries. I was told by everyone that I would never be able to make the team just because I was chubby. But I never let that break me down. I promised myself that by the end of the summer I’d earn the right to play. So I put in the work for a whole summer, 7 days a week, pushing myself to the limit until the try out day finally came to prove to everyone that I can make the team — and I got in! The whole process helped me to grow stronger and gain more confidence in myself and my abilities. It also helped me with stress management. When I feel overwhelmed, all I do is take a ball, get some friends together and play the beautiful game. When people ask me why I didn’t go down the wrong path and get involved with gangs, there’s always one answer: football. Football has always been my focus and being part of that community that football creates kept me on the right path. However, finding a job in my desired field — youth development — has been difficult. I started getting involved in youth work when I was 14. My friends and I started a group called “Project Can” to help empower youth in our community. Through the group we would also visit elderly people who were cut off from the community. We spent time with them to make them realise they hadn’t been forgotten. I stayed in this line of work but it took years to find a suitable job where I could build my knowledge of youth development. It was around 2012 when I met the founders of the Sacred Sports foundation — Delroy and Nova Alexander. It was at that point, though I didn’t know it yet, that my life would change forever. Through The Sacred Sports foundation, I got the chance to meet young leaders from all over the world who helped educate me in the field of youth development. I took part in the Court Diversion Programme, which is run by the Sacred Sports foundation, to help troubled kids channel their anger and teach them life skills. 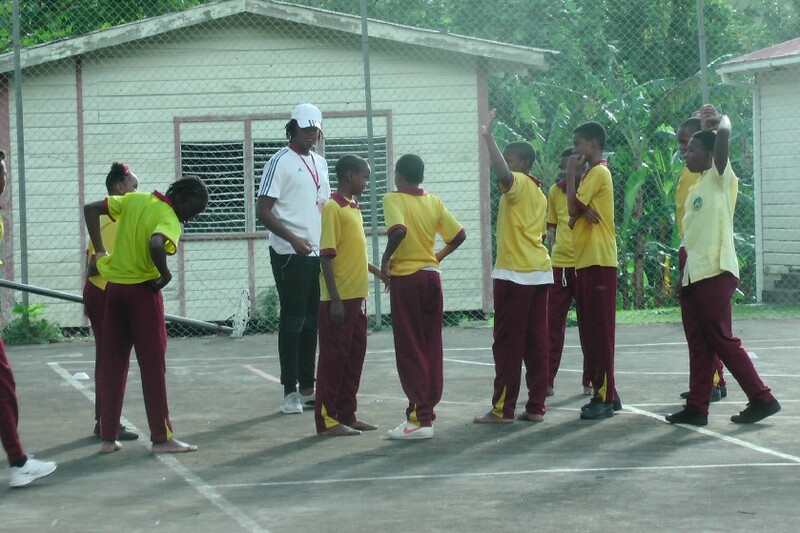 I have also had the opportunity to lead a few programmes and activities with the Sacred Sports foundation’s sponsored Beyond the Bell (BTB) afterschool programme. I help the kids with their homework and teach them the importance of education before we coach them to improve their skills in football, basketball, cricket, or table tennis. I also implemented the streetfootballworld-developed football3 model at BTB that focuses on fair play, equality and teamwork. Right now I am in the process of creating a new group in my community to help develop after-school programmes on career guidance, life skills and the different sports. This will also give young people in my community a job and a way to build themselves as youth mentors as well as an alternative to a life on the streets. But my favourite thing happened this past summer. This is where I was chosen to go to Russia to attend the FIFA Foundation Festival. I got to meet many youth mentors from around the world and also got to mediate a football3 game at the Red Square. Visiting Russia was an experience I will never forget and I will always be grateful for the opportunity. Twelve years later and I’m still playing for the Canaries and loving every minute of it. I used to be such a shy kid all those years ago when I tried out for the team. You wouldn’t see me speaking to anyone. But now that I have been exposed to so many programmes and activities, I have broken free from my shy shackles. These programmes and activities have helped me so much. They have opened up a new world for me. There are so many possibilities and so many things that I see I can do within my community to help change the mindset of my people. I keep in regular contact with some of the people I grew up with who have joined gangs and I hope that, one day, they will see that they can be so much more. I really want football to do for the kids I coach, what it has done for me. I tell them: “just believe in yourself, no matter what setbacks come your way, stay on the path you’re on. You’ll make mistakes, especially on the pitch, but that’s how you learn and become a better player and a better person. Football will always keep you on the right track.” With the help of football and the Sacred Sports foundation, I know that I can achieve anything. The sky’s the limit.